Northland College announced today for Earth Day their choices for the best in nature writing this past year. 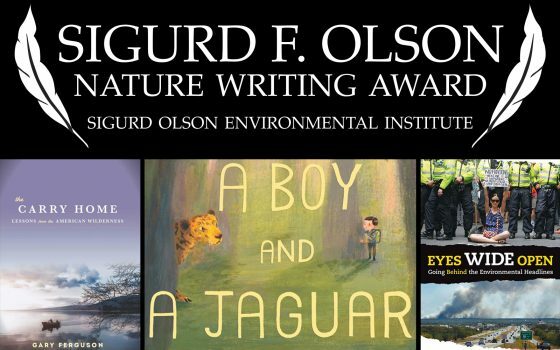 Three authors have been selected to receive the Sigurd F. Olson Nature Writing Award (SONWA) for adult, young adult, and children’s literature. 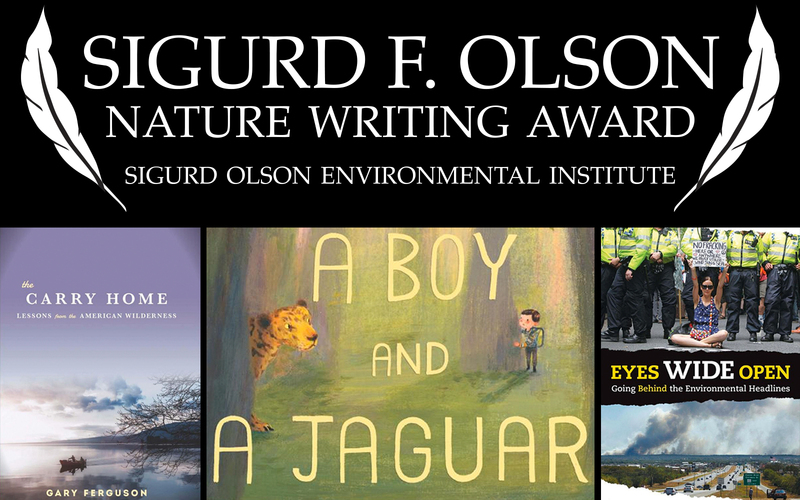 Established in 1991, the SONWA honors the literary legacy of Sigurd F. Olson by recognizing and encouraging contemporary writers who seek to carry on his tradition of nature writing. Organizers expanded the award to include children’s literature in 2004. This year marks the first to honor young adult. The winners include: adult author Gary Ferguson, pictured above, for The Carry Home: Lessons from the American Wilderness, young adult author Paul Fleischman for Eyes Wide Open: Going Behind the Environmental Headlines, and children’s writer Alan Rabinowitz for A Boy and a Jaguar. All three books were published in 2014. Committee members selected The Carry Home for this award because it is an evocative reflection on Ferguson’s journey to fulfill his wife’s dying wish to scatter her ashes in the five remote locations they loved and shared together. The memoir chronicles the uplifting power of nature and challenges readers to consider how to foster empowered relationships with wild places. The Carry Home embodies Olson’s literary legacy through its articulation of the Wilderness Movement, exploring the fundamental meaning of wilderness and by being a “well-written story stylistically,” said Alan Brew, associate professor of English at Northland College, who served on the selection committee. In Eyes Wide Open, Fleischman offers teens an environmental wake-up call and a tool kit for decoding the stream of conflicting information confronting them. In A Boy and a Jaguar, Rabinowitz recounts his experience of growing up with a severe stutter and feeling connected to caged animals in the Bronx Zoo, who like him do not have a voice in A Boy and a Jaguar. In this tale, he describes how his connection to these voiceless creatures was the driving force behind finding his own voice, becoming a zoologist and persuading the Belize government to establish the Cockscomb Basin Wildlife Sanctuary and Jaguar Preserve. “Rabinowitz’s work carries Olson’s legacy through giving a voice to the wildness within and outside of each of us,” said SONWA selection committee member Eileen Van Pernis. The SONWA committees also recognized Margarita Engle for Silver People: Voices from the Panama Canal (young adult) and children’s author Phyllis Root for Plant a Pocket of Prairie for books worthy of honorary mention. Mark Peterson, executive director at the Northland College Sigurd Olson Environmental Institute that oversees the awards, hopes the SONWA serves as an encouragement to nature writers and readers across the nation. In addition to the award, each author will receive a cash prize and present at the Northland College campus this fall.